We can give our money and time to so many causes. Those refugees in Syria need help. There are orphans all over the world. Children need sponsored and adopted and fostered and mentored. Wells need to be funded and built. Third-world villages need medical care and access to education. Single moms could benefit from sustainable solutions to their problems. Our neighbors need to be invited in so they can meet Jesus. James reminds us faith without works is dead. 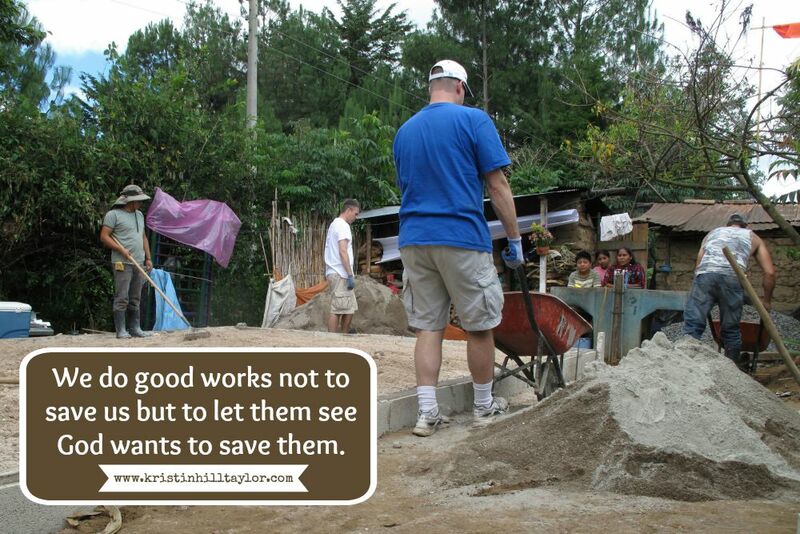 Those works don’t save us, but they may save someone else. Those works don’t determine our identity in God’s kingdom, but they can grow God’s kingdom. I can do good work in Jesus’ name, but I can’t do all the good work. And neither can you. Facebook is full of good causes. Our friends all promote whatever it is that moves their souls. Hunger. Homelessness. Orphan care. Adoption. Medical aid. Sustainable business opportunities. Life skills. Short-term missions. Long-term missions. Every single one of those things and so many other causes are important. And we should tell people about them. But they aren’t all going to be my things. And my things aren’t necessarily going to be yours things. And we’re going to learn more about God and ourselves in the process, anyway. I’m linking up with the weekly Soli Deo Gloria Sisterhood Gathering.